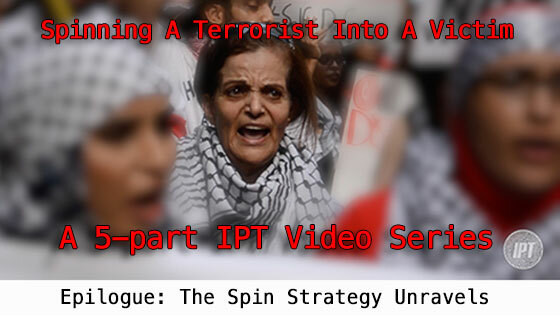 Spinning a Terrorist Into a Victim - Part 1 - Who is Rasmieh Odeh? Note: Part 1 includes our previously released 2-minute prologue/trailer. To see Part 2, "Rasmieh Odeh's Victims," click here. To see part 4, "Rasmieh Odeh's Changing Story" click here. Starting Nov. 4, federal prosecutors in Detroit present their case against a Palestinian woman who slipped through the cracks. 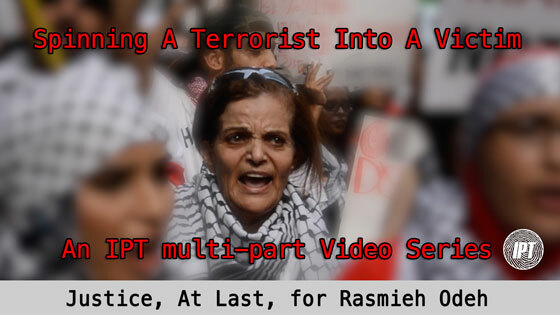 Rasmieh Odeh, 67, has been in the United States since at least 1995. To her advocates, she's a peaceful community activist living in Chicago and an asset to her community. Yet, she has a bloody, dark side that she has kept hidden all these years. Odeh is a convicted terrorist who spent 10 years in an Israeli prison. She led a 1969 bombing that killed two college students in a Jerusalem supermarket. Odeh confessed. She says that confession only came after she was tortured. She was sentenced to life in prison, but was released unexpectedly as part of a prisoner exchange in 1979. Her torture claim has never been substantiated—even by the United Nations, to which she reported the alleged torture after her release—and she has yet to deny her involvement in the murders or even her ultimate imprisonment. Odeh could have discussed the particulars of her situation when she applied for her visa and citizenship—how her sentence was even commuted—if she felt her alleged torture merited special consideration. Instead, she simply told U.S. authorities she had a spotless record. Prosecutors say that constitutes immigration fraud. A terrorist conviction for an attack causing two deaths is something immigration officials would want to consider before granting an immigrant a visa or welcoming her into American citizenship. Still, her supporters have launched an aggressive campaign aimed at getting the fraud charges dropped. Odeh, they say, is the real victim here. They claim this case is really about a government conspiracy to attack Palestinian advocates in America. The campaign is led by Odeh's colleagues from the Arab American Action Network (AAAN), but has attracted support from the Council on American-Islamic Relations (CAIR), American Muslims for Palestine (AMP), the Arab-American Anti-Discrimination Committee, and even a group of 124 feminist academics. 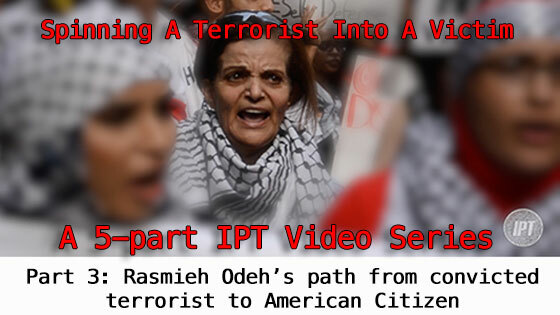 In the video above, the first installment of a five-part Investigative Project on Terrorism video series on Odeh's case and the campaign to thwart it, we provide an overview of the case and a look at Rasmieh Odeh and those supporting her. New installments will be released each day this week. Tomorrow we examine the 1969 Jerusalem bombing Odeh helped orchestrate and learn more about her victims. The Koran says Muslims can lie, and that they do. She lied on her application to get into the United States, lied when she said she did not understand what she was signing, then lied in court. Since the Koran says they can lie, they have taken it literally, and lie not only for religious purposes, but to commit all types of crimes, to get out of all types of crimes, and to just generally lie. It is outrageous that she was even allowed in to the United States let alone granted residency. She should have been jailed for life- only allowed out due to more terrorism leading to her release. Moreover, if she is such a patriot Palestinian why would she have left Jordan and come to the U.S.? To me, it would be criminal to allow her to reap the benefits of U.S, residency and citizenship given what she did. And, to top it off, nowhere did we hear of any remorse for what she did. Let her go back to the Middle East haven she is aspiring to. Perhaps a month or two in Syria or Iraq or Jordan or the Arabian Peninsula will help her understand that if terrorism succeeds the way women are treated there (would she dare to walk the streets alone? To appear in public without a head covering?) is what awaits her if her goal of destroying Israel were to be achieved. At a time when we are fighting terrorism world-wide, it would be a huge mistake to send a message that one can be a terrorist and then rewarded. It is akin to the 1,000 plus nazis who, to our great shame, were granted U.S, protection and citizenship- and even social security retirement benefits. What will it say about our own values if she is allowed to remain in the U.S. ? This is very simple. If she lied on her application just deport her. This is pure madness. Do we not do a thorough background check on those that want to be in this great country? I think the community will do just fine without the like of her. We must be firm in our policies to protect the American people and not bend to the will of few. The United States, always the sucker. The libs/lefties/Democrat people have perverted the "send me your huddled masses" and have turned it into "send me anyone that wants government goodies and will vote Democrat." This pathetic human being, Odeh, could not have emigrated to Sweden?